Keep­ing in view the aggra­vat­ed nature of Glob­al Ter­ror­ism in the 21st cen­tu­ry, coun­tries have respond­ed proac­tive­ly by leg­is­lat­ing strin­gent new laws to deal specif­i­cal­ly with the threat. The Indi­an state stands alone in its strange con­vic­tion that legal process­es of an ear­li­er cen­tu­ry should not evolve to deal with aggra­vat­ed lev­els of threat to civ­il soci­ety in the 21st cen­tu­ry. The lev­els of force usage and the strin­gency of the laws are increas­ing expo­nen­tial­ly in all oth­er nation states. The lev­els of force usage by Amer­i­ca in Iraq and Afghanistan and the Rus­sians in Chech­nya have been stag­ger­ing and unre­strained. It was said that force usage norms in for­eign coun­tries can­not be applied to one’s own coun­try. Sri Lan­ka, Chi­na and Pak­istan have used stag­ger­ing lev­els of force against insur­gents in their own ter­ri­to­ries. The Sri Lankans waged a ruth­less civ­il war employ­ing offen­sive air and naval pow­er, tanks and heavy artillery. The Sri Lankans have suc­ceed­ed emi­nent­ly in total­ly destroy­ing the LTTE. It is one of the few exam­ples of suc­cess­ful ter­mi­na­tion of a vicious insur­gency that had reached the lev­els of a civ­il war. The scale and scope of the Sri Lankan mil­i­tary suc­cess rais­es some crit­i­cal ques­tions about our basic approach to this genre of con­flict. Though the Indi­an man­pow­er ori­ent­ed approach is high­ly tout­ed — in actu­al fact it has suc­ceed­ed deci­sive­ly only in two cas­es — Mizo­ram and Pun­jab. In all the oth­er CI / CT cam­paigns the Indi­an Army has only achieved con­flict man­age­ment in Naga­land, Manipur, Assam and to an extent even in Jam­mu and Kash­mir. Bar­ring the two suc­cess sto­ries of Mizo­ram and Pun­jab, we have failed sin­gu­lar­ly to bring the con­flicts to clo­sure. This is pri­mar­i­ly due to a lack of syn­er­gy between the civ­il and mil­i­tary com­po­nents of the state. Naga­land has dragged on for over five decades and the sit­u­a­tion is still uncer­tain. Manipur is still a hotbed of vio­lence. Assam may be head­ing for clo­sure but only due to unstint­ed sup­port from the new gov­ern­ment of Bangladesh. Chi­na how­ev­er is renew­ing its arms sup­ply to the north-east­ern insur­gen­cies and we have sin­gu­lar­ly failed to deter Jiha­di attacks against our cit­i­zens. In fact our will­ing­ness to com­pro­mise in this domain now bor­ders on the shame­ful. The great­est threat is the ris­ing men­ace of Left Wing Extrem­ism in the dense for­est tracts of Chhat­tis­garh, Oris­sa, Jhark­hand and Gad­chi­roli. Some 85 per cent of India’s trib­al pop­u­la­tion lives here in cen­tral and penin­su­lar India. It is now in open revolt. The total num­ber of ter­ror­ists in Jam­mu and Kash­mir nev­er crossed 4,500. The armed Maoist cadres now num­ber over 15,000. Their exper­tise in IEDs is lethal and wide­spread. We are gross­ly under­es­ti­mat­ing this crit­i­cal threat. Frankly it is slip­ping well beyond the capa­bil­i­ties of the Police and Cen­tral Armed Police Forces (CAPFs). The threat from Chi­na is ris­ing with every month. A Jiha­di coup in Pak­istan or its implo­sion could cre­ate an unprece­dent­ed lev­el of exter­nal threat. With this back­drop we can­not afford a leisure­ly approach to LWE, hop­ing that our police forces will get com­bat­ised enough over the next decade to deal with this threat. Oper­a­tion Green Hunt that was launched with such fan­fare was tripped up by the severe casu­al­ties inflict­ed on the untrained CAPFs who are nei­ther struc­tured nor organ­ised for such offen­sive CI oper­a­tions in such dense jun­gle ter­rain. The CRPF in par­tic­u­lar lacks the oper­a­tional ethos, oper­ates most­ly on a com­pa­ny and not a bat­tal­ion basis and relies on civil­ian con­trac­tors for its logis­tics. It has unfor­tu­nate­ly tak­en the heav­i­est casu­al­ties. After this ini­tial set­back, most offen­sive oper­a­tions have been frozen to save face and obvi­ate fur­ther casu­al­ties. 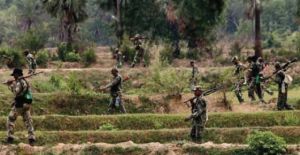 The Maoists in turn have realised that it would be high­ly counter-pro­duc­tive for them to inflict fur­ther casu­al­ties on the CAPFs because it would gen­er­ate pres­sures to bring in the Army. This the Maoists want to avoid at all costs at this stage. The key ques­tion is do we have to oblige them or con­form to their game plan? Today there is a clear need for a whole of the gov­ern­ment approach. We can­not view the Exter­nal and Inter­nal Secu­ri­ty threats in iso­lat­ed com­part­ments. The Chi­nese threat in Tibet has risen from 22 divi­sions in two sea­sons to over 34 divi­sions which can now be induct­ed in one sea­son. The Indi­an Army will have to respond by rais­ing at least 5 to 6 new divi­sions. We should raise them urgent­ly. We could well blood them ini­tial­ly in Chhat­tis­garh, Jhark­hand and Oris­sa before their com­mit­tal to our Himalayan bor­ders. There is a dire need to raise the right sort of Units that can deal both with the exter­nal and inter­nal threat dimen­sions. Com­bat­is­ing the police is not a ratio­nal or cost-effec­tive response. In such a com­bi­na­tion threat sce­nario, rais­ing more CRPF bat­tal­ions will not real­ly be a cost-effec­tive option. These units are cur­rent­ly not in a shape to con­duct offen­sive CI oper­a­tions and will be absolute­ly of no use in any war with Chi­na or Pak­istan. Rais­ing infantry / moun­tain divi­sions for the Army is a far more ratio­nal and cost effec­tive response in the cur­rent sce­nario. India sim­ply can­not afford to retreat from its mod­el of min­i­mal mil­i­tary force in response to sub-con­ven­tion­al con­flicts. In fact, in view of the expo­nen­tial rise in the lev­els of vio­lence, India may be forced to recon­sid­er the term “Min­i­mal force” and replace it with what Lt Gen Rus­tom Nana­vaty terms “Pro­por­tion­al force”. The force used will have to be pro­por­tion­al to what is employed against us. Our pes­simist and defeatist approach of just man­ag­ing the lev­els of vio­lence — needs to be replaced by a more proac­tive approach that seeks the suc­cess­ful ter­mi­na­tion of the insur­gency (char­ac­terised by seri­ous attri­tion on the insur­gent organ­i­sa­tion lead­ing to a sur­ren­der of arms by “the insur­gents” and their re-merg­er in the demo­c­ra­t­ic main­stream). Man­ag­ing con­flicts may not be enough. We need to bring them to clo­sure by using pro­por­tion­al lev­els of force. Inter­nal con­flicts can­not be allowed to drag on for decades. Such desta­bil­is­ing lev­els of restraint in mil­i­tary force usage are not cost-effec­tive in the long term and the nation can­not afford this lux­u­ry just so that some hare-brained NGOs can score brown­ie points in Europe and else­where. It is the state’s duty to pro­tect its cit­i­zens from the esca­lat­ing lev­els of vio­lence by non-state actors. We need to get our act togeth­er by a “whole of the gov­ern­ment” approach that gen­er­ates syn­er­gy between the var­i­ous organs of the state as also the cen­tre and the states. The time is ripe for a doc­tri­nal debate across organ­i­sa­tion bound­aries. Defence and Secu­ri­ty Alert (DSA) mag­a­zine is the only ISO 9001:2008 cer­ti­fied, pre­mier world class, new wave month­ly mag­a­zine which fea­tures par­a­digm chang­ing in-depth analy­ses on defence, secu­ri­ty, safe­ty and sur­veil­lance, focus­ing on devel­op­ing and strate­gic future sce­nar­ios in India and around the world. Mumbai 26/11 — Have the hotels learnt a lesson?